This is a brand new replacement Binatone Veva 1210 cordless phone battery. It is a 3.6V NiMH uprated battery pack and is the exact fit relacement for the Binatone Veva 1210 corldess phones made for the UK market that were fitted with a 3.6V battery. 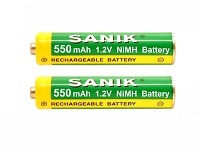 The original Binatone Veva 1210 battery was either a Sanik Ni-MH Battery 3SN-2/3AAA30HSJP1 3.6v 300mAh pack or a GP30AAAM3BMX 3.6V 300mAh battery pack. This battery pack has 3 batteries that are shorter than full size AAA batteries and are 2/3AAA size. The new version has a higher capacity 400mAh when the original was 300mAh - this will give longer use and call times. Please check you Binatone Veva 1210 battery is 3.6V as some models came with a 2.4V battery and this battery is NOT a suitable replacement for the 2.4V version.